Scientists are to study zebrafish in an attempt to understand the cause of Lowe Syndrome - a rare incurable genetic disorder which affects only boys. The inherited condition can produce cataracts of the eyes, defects in brain development and kidney problems in young male sufferers. Experts at the University of Manchester will look at the gene OCRL1, a key factor in the cause of the disorder. 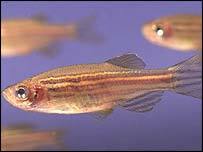 The gene works in a similar manner in zebrafish as it does in humans. Dr Martin Lowe, who will lead the research, said: "Lowe syndrome is a rare disorder. "Life expectancy is short due to complications associated with the disease, which can cause blindness, arthritis, rickets, mental impairment, development delay, tooth and bone decay and kidney failure." The research is being funded by a £72,000 grant from the Lowe Syndrome Trust. Lowe Syndrome was first outlined by US scientists in 1952. It arises from a mutation in the gene, which is involved in degrading fat soluble molecules in the body called lipids. Dr Lowe said: "Zebrafish offer a number of advantages over other model systems and we plan to extend our earlier analysis to further scrutinise the role of OCRL1 in development, focusing initially on the brain but also examining the other tissues affected in Lowe syndrome. "In the long term it is hoped that zebrafish will serve as a model system for experimenting with chemicals that suppress the symptoms of Lowe syndrome in the hope of one day finding a cure."